BAKERSFIELD, Calif. — Earl Bartholomew served for four years as a 2nd Class Motorman in the United States Navy, fighting in the Korean War and returning to the States in 1955. To help with his disability, he built a makeshift ramp in his home to gain access to his home with his motorized scooter and wheelchair. That ramp began to fall apart after years of wear and tear. Today the Young Marines of Bakersfield came together to build a brand new ramp for Bartholomew’s home. “What we’re gonna do is replace the top of it reinforce the bottom structure and we’re gonna recarpet the top of that so it’ll make it look really nice and we’re gonna anchor down the side rails.” said Executive Officer of the Young Marines, Derrick Fuller. 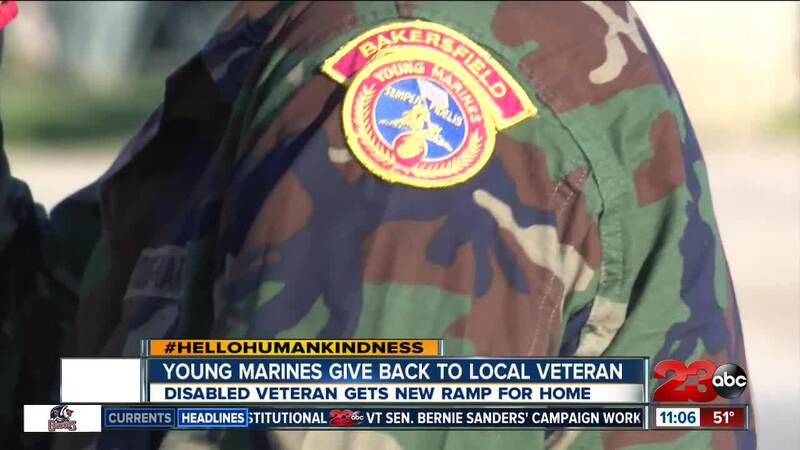 The Young Marines of Bakersfield is an organization a youth education and service program under the Marine Corps. “We teach them honor, respect, courage. We go on camp out, we do a lot of things that other youth organizations would do,” said Fuller. With discounted supplies from Home Depot, the Young Marines spent hours demolishing the previous ramp and installing a new and improved one. “Home depot on Gosford was generous enough to give us 50% off,” said Fuller. As for the Young Marines who volunteered, they say giving back reminds them of the sacrifices made by those who serve. For more info on the Young Marines of Bakersfield, visit their website or Facebook page .